Tonight on FOX is an all new episode of Hell’s Kitchen. On tonight’s show the conclusion of the remaining 13 Chef’s compete and you know we will have plenty of craziness by Chef Gordon Ramsay. If you missed the first part of the 13 chef’s competing, we have a full and detailed recap here for you. On last week’s episode Hell’s Kitchen, the men won the challenge with their sea bass and got a couple of grand to spend at a boutique in Malibu, while they went wine tasting. The women had to hand build a runway, make centerpieces for Hell’s Kitchen first ever fashion night. The women were quickly losing it, their punishment involved a lot of hard labour. Hells Kitchen was moments from opening and Chef Ramsay briefed everyone on how he wanted everything to go, the timing was very important but Clemenza wasn’t listening and started the scallops before they were even ready to begin. Tonight the show continues with the fashion show and when the bikini clad models go down the runway, the blue team makes rookie mistakes as they are very distracted. Meanwhile the red team is ready to explode, Kimmie probably weighs in at 300 pounds and if I were Robyn, I wouldn’t want her on my bad side. 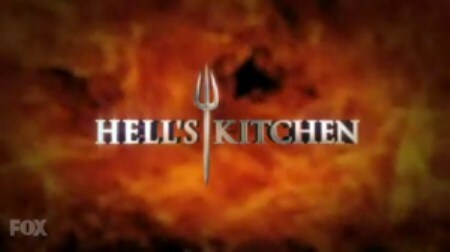 RECAP: Now it is time for the continuation of last week’s Hells Kitchen. Clemenza tries to get ahead by starting the scallops before Chef Ramsay even gives the blue kitchen a ticket, he wasted four scallops. The kitchen opens for the first time in Hell’s Kitchen history with three mini fashion shows. Royce and Kimmie have been chosen to help plate food to keep up the quick pace. Part one of the fashion show is beginning and it’s time for the red kitchen to get their three appetizers out to the pass. Barbie tries to correct Tiffany whose pan isn’t hot enough, but she doesn’t listen and the scallops sent back from Chef Ramsay. The blue kitchen is ready with their first orders. Clemenza is getting cranked, there are way too many scallops for him to prepare and do it right. Tiffany finally has success with the scallops; Christina and Dana are trying to get their appetizers to the pass when Robyn is searching for work and getting in the way. All the diners on the red side are happy with what they have received. Clemenza is holding up the service with his scallops, Guy can see the blue kitchen going down. Guy helped out, but he rushed it and created a bigger mess. Clemenza and Guy are still working on the scallops while Royce goes back stage to the fashion show and tells them the kitchen needs another five minutes. The men finally deliver all of their appetizers. Chef Ramsay tells everyone that the timing was dreadful, so this round, they need to do it right. Guy’s head is on the catwalk, he just can’t stay focused with the models coming down the runway in their swimsuits. Clemenza is like a lost cat sometimes, he doesn’t know where he’s going. Robyn screwed up the beef, she over cooked it and needs to more, most of the women chicken out to go to the blue kitchen but Christina heads over, returns without the beef. In the blue kitchen, all eyes are on Guy on the meat station and he is making rookie mistakes. In the red kitchen, Tiffany’s swordfish cooked by Christina is cold when it comes to the pass. When Chef Ramsay loses it, Tiffany doesn’t take responsibility for her station because she doesn’t to take blame. Entrees are finished in the red kitchen, the blue kitchen is waiting for Guy’s beef and Royce’s ability as a master plater. Royce gets thrown out temporarily for using a dirty rag to wipe the plates before they are sent out to guests. Dinner service is over and Hell’s Kitchen first ever fashion show was less than perfect. The women’s red team is the winner. Blue team has to come up with two names that will be up for elimination. The blue team decide that Clemenza is the first person nominated, the second nominee is Guy. Chef Ramsay calls the two forward. Chef Ramsay asks Justin who should go home, he says Clemeza, so does Royce, Roshni, Brian and Patrick. Chef Ramsay chooses to send Clemenza back in line, Guy is eliminated.